I’m sure I’ve introduced no less than five recipes on here over the past year proclaiming them to be my new favorite breakfast recipe. Breakfast is my favorite meal to cook at home and I’m constantly experimenting, so its probably no surprise really that I keep changing my “favorite” breakfast dish. 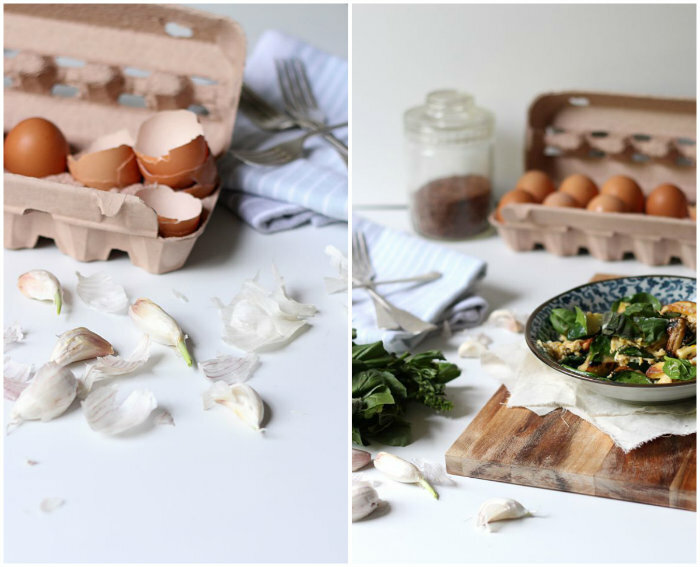 The current flavour of the month is this super simple but incredibly delicious vegetable and halloumi scrambled eggs. 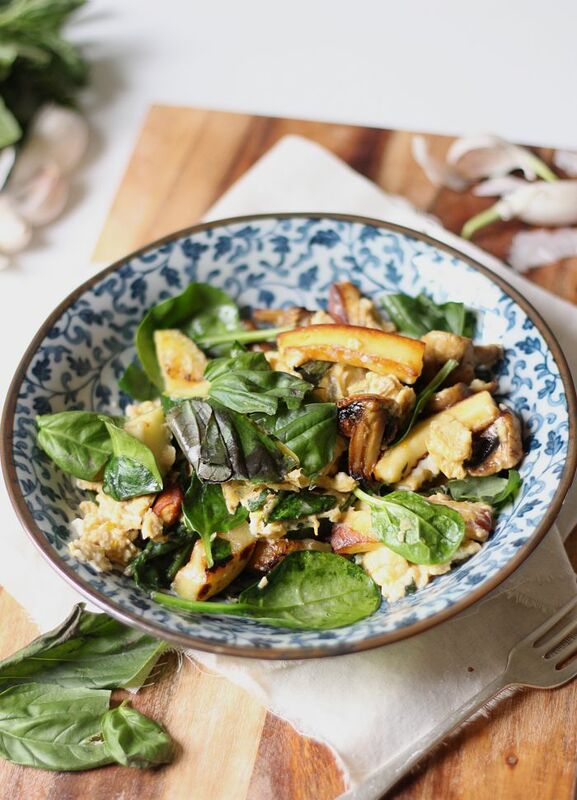 You may have read the title of this dish and thought – scrambled eggs and veggies? Really? Surely that’s too simple/bland/basic/boring to have a whole blog post written about. But I assure you, its not. By adding in one simple ingredient – the halloumi – this dish is completely transformed to become a super tasty, quick and healthy breakfast. Just make sure not to overcook the veggies or over scramble the eggs! This is the type of breakfast that I never would have thought of eating a few years back – after all, eggs and cheese are fattening, right? W R O N G !! 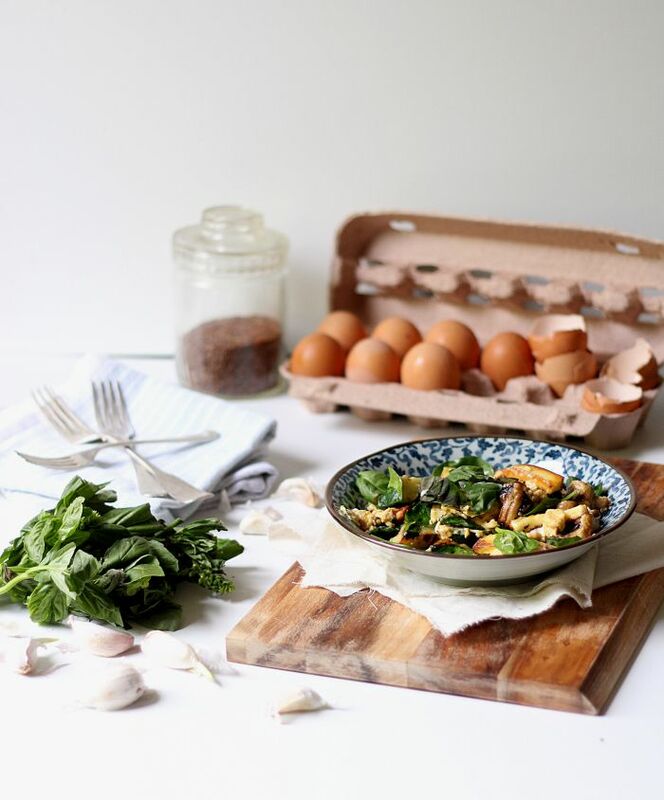 Eggs and haloumi are both great sources of protein, and paired with a generous serve of veggies, they make a great healthy breakfast option that will leave you feeling full well into the day. And of course there’s that added bonus of it tasting ahhhhhhh-mazing. Halloumi is such a tasty little addition to this dish. 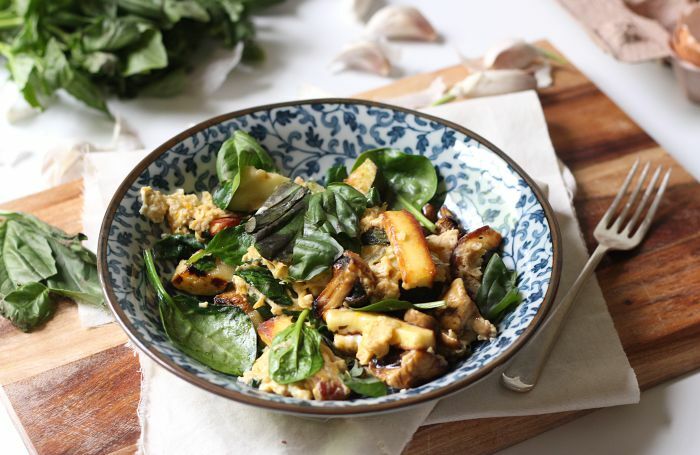 As the star ingredients of this dish are super tasty halloumi, and the eggs being the main component which ties it together, it’s a little hard to make this dish vegan, however you could fry a little firm tofu lightly in oil in place of the haloumi, and then scramble some tofu in place of the eggs. On the other hand, if you feel the dish needs a lititle meaty boost (to which I would argue strongly against, but each to their own), you could fry some sliced chorizo with the halloumi, or flake through some smoked salmon at the end. Heat butter in pan over mid to high heat. Add mushrooms, zucchini and garlic and fry 2 mins - they should be slightly soft and starting to colour on the outside. Push to the side of the pan, creating space to fry the halloumi. Add the halloumi and fry 30 seconds on each side. Add spinach and stir through. Push to the side with the veggies. Reduce to a low to medium heat and add the lightly whisked eggs and basil. Let sit a few seconds allowing the eggs to start to set at the bottom of the pan, and then using a wooden spoon, push the mixture into the middle of the pan, allowing the runny, uncooked eggs to spill out to the side. Allow to sit a few seconds again and then repeat. Do this once or twice more until the eggs mostly set, then quickly stir in the veggies and halloumi. Remove from the get, and serve immediately. « The best ever chocolate fudge cake + happy first blog birthday! What a great idea to add halloumi to eggs, I haven’t ever tried them together. And the veggies included remind me of a proper English breakfast we would have in South Africa where they serve eggs with sauteed mushrooms and grilled tomatoes on the side. :) Only this looks way better. Please clarify what is meant here.